There is a narrow and mysterious road that travels far north in Queensland, Australia. It begins in the sleepy sugar-cane town of Mossman and winds north along the coast deep into the mystical Daintree rainforest, up to a headland discovered by Captain James Cook in 1770, when his boat almost sank as it hit the Great Barrier Reef. He named it Cape Tribulation, as it was there that all his troubles began. 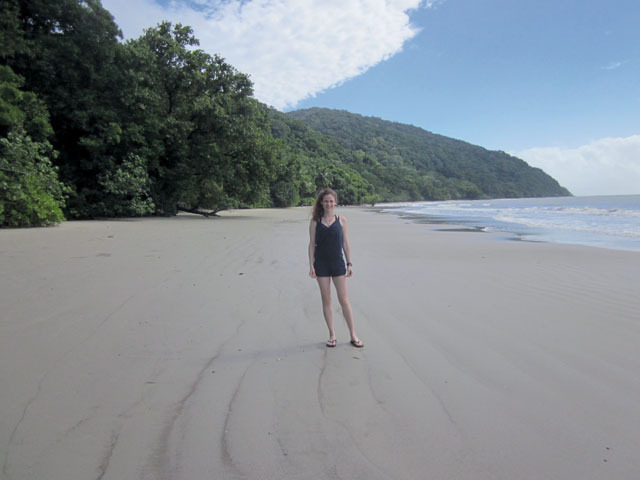 Cape Tribulation is where all my troubles faded away. It is where the rainforest meets the reef. Stranded in paradise, there is no phone reception and Internet is unaffordable at $8 for 15 minutes. With a population of about 100, there is just one measly store (with few and very expensive things), one café, a few tourist attractions/activity houses, and a handful of B&Bs and hostels. 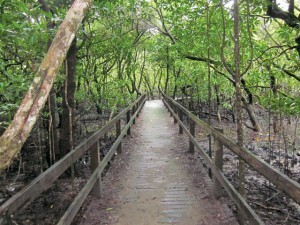 The Daintree rainforest was listed as a world heritage site in 1988. It is one of the oldest rainforests, with an ancient tropical ecosystem that is home to a plentiful diversity of wildlife. All this diversity is contained within an area that takes up about 0.1 per cent of the landmass of Australia. There are small tours from Cairns and Port Douglas that bus tourists to the cape and include activities. It is how most tourists make the trek. 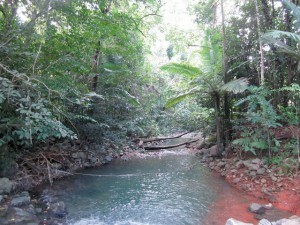 I was picked up in Port Douglas, and after a short drive we reached a river. We took a small boat ride and spotted a scary-looking crocodile, soaking in the sun along the riverbank. After travelling a few kilometres farther north, lush green life overtaking every bit of space, we were immersed in the Daintree. On a short hike, our tour guide told us about the famed cassowary—the stunningly large, endangered bird that calls Daintree home. It has plush long fluffy black feathers, a bright blue neck, and is one of the most dangerous birds in the world. They have bone-breaking kicks and blade-sharp claws. It is Daintree’s proud mascot, and just after explaining this to us, as though on cue, an exquisite cassowary leisurely walked up to our group, around us and then away. We frantically took pictures while our poor tour guide, fearing for our lives, panicked while reminding us to give it space! I stayed in a dorm at the secluded Cape Trib Beach house. It was about a 45-minute walk to, well, anything. During my first night, a frighteningly loud BOOM on the roof awakened us all. Confused and tired, we went back to sleep, only to be woken up later again by another BOOM. The next morning we were relieved to learn from the receptionist that it had been coconuts falling. Activities in Cape Tribulation include horseback riding on the beach, zip-lining through the jungle, hikes and exotic-fruit tasting. Most activities are run by locals. Although I am a finicky eater, at $30, the exotic-fruit tasting and farm tour was somewhat of a bargain and, being in the jungle, I was prepared to take some flavourful risks. Because of the tropical climate, rare and exotic fruits from the Amazon, Southeast Asia and the Caribbean grow on the cape. The guide gave us a short background about each fruit and explained how to prepare them. West Indian lime, Longan, Black Sapote, Dragonfruit, Yellow Sapote, Sapodilla, Matisia, Davidson Plum, Soursop, and Custard Apple were items on the menu. It was quite the display of bizarre looks, textures and tastes. One of them looked like dry, processed cheese, while another resembled chocolate pudding. Tastes ranged from extremely sour to super sweet. I gathered my courage and participated in a night hike, run by a local tour company. The thought of trekking though the jungle at night, with all the giant (and hairy!) spiders, snakes and crocodiles terrified yet enthralled me. Armed with flashlights and raincoats, our brave troop hiked through the jungle, spotting plants and animals when they are most active. Although we encountered giant spiders, lizards, snakes and even a crocodile, I felt surprisingly tranquil. There is something about the rainforest that is extremely calming. The life energy radiated everywhere. It is undeniable. It felt like I was within a living being. The trees grow so high with their branches, leaves and vines intertwining through everything, the sky is barely visible. There is life growing upon life growing upon life, and if you sit in silence, look and listen, you will begin to see it—the insects, the birds, the fruits, movement and life is everywhere. If you aren’t into nature, reading, or meditation, you may just drive yourself mad. There isn’t much to do, and many of my fellow backpacker friends, whom I met in the dorms, were bored. Who are we without our smartphones? Furthermore, the humidity is so intense that it made my hair into a mini jungle. We did spend one amusing evening opening a coconut—without a machete, it ain’t easy. Walking down the sidewalk from the beach I encountered a lace monitor lizard, at more than five feet, he looked like he was left over from the dinosaur era. He lazily walked next to me down the path and then lay in a sunny spot. Though I got used to the giant spiders, deadly stingers, killer birds, snakes, crocodiles, and even the gecko I found in my bed, I never got used to the terrifying sounds of coconuts crashing onto the roof at night. Be the first to comment on "How I shed my troubles at Cape Tribulation"